NANUK cases are loaded with innovative features. Countless hours of research and development went into defining the requirements for NANUK. The result is a line of cases that are equipped to meet today’s challenges. Responding to feedback from professionals in various fields, NANUK is the evolution of traditional protective cases. 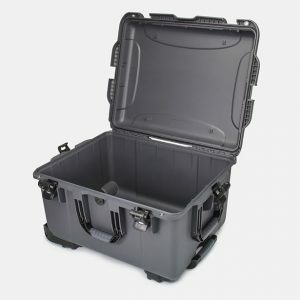 They are designed to protect and transport your gear whether you are shipping delicate cargo around the world, transporting sensitive medical equipment, or protecting expensive electronics from the elements. Law enforcement agents, photographers and hunters all know that if it needs to get there in one piece, it needs to go in a NANUK. Nanuk Professional Protective Cases are are manufactured and assembled entirely at Plasticase’s factory located in Terrebonne, Quebec, Canada. They are made from a rugged and highly impact-resistant polypropylene-based resin, engineered to meet or exceed stringent military specifications by Plasticase specifically for use in their Nanuk product line. Their crush-proof design has gentle rounded corners and a thick-walled construction for increased strength and rigidity while remaining flexible enough to absorb the shocks from falls and everyday abuse without compromising the integrity of the protective case and its contents. NK-7 resin is a durable thermoplastic polymer, fortified with several performance-enhancing additives for their superior strength and impact resistant properties, all while remaining lightweight. NK-7 is designed to perform optimally in temperatures between -20°F and 140°F. Most NANUK models are available in a wide variety of colors including: black, graphite, silver, tan, olive, orange, lime and yellow. However, custom coloring and graphic options are also available by special request. The NANUK 960 is the largest wheeled case currently available from Plasticase. The exterior dimensions are 25.4″ long, 20″ wide and 14.5″ tall, and it weighs a total of 19.2 pounds empty. 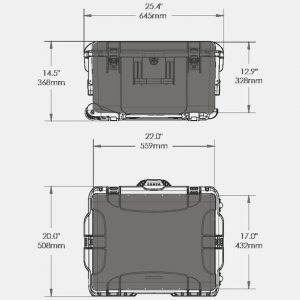 The interior of the case is 22″ long, 17″ wide, and 12.9″ tall providing as much as 79 liters of room for gear and padding. The depth of the lid is 2.1″ and the base is 10.8″. 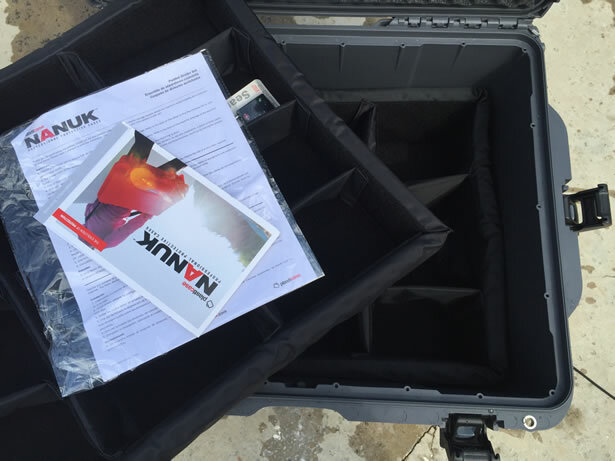 NANUK cases are packed with innovative features including their patented PowerClaw Latching System. The rugged nylon construction of the PowerClaw clamps securely holds the lid tightly closed while the integrated slide locks prevent the latches from accidentally opening during transport or from the shock of a hard impact. The NANUK 960 provides one PowerClaw latch at each end and two across the front due to its large size. The removable stainless steel hinge pin runs through the entire length of the case so the lid can be removed completely and without much effort. To secure the contents, each NANUK case is equipped with at least two padlockable hasps reinforced with stainless steel molded right into the lid and base for added strength. High-quality TSA approved combination padlocks are also available when ordering directly from the NANUK website. Each NANUK case feature one or more foldable handles with a spring-loaded mechanism to keep them tucked out of the way when not in use. They are made from NK-7 resin with a soft rubberized non-slip grip for added comfort and a secure grip, even in wet conditions. The NANUK 960 includes one handle on each side of the case plus a third along the front edge. A shoulder strap can also be added simply by attaching the ends of the strap to the case utilizing the two reinforced padlock hasps. There are also some small loops molded around the base for tying down the case. On wheeled models like the NANUK 960, there are two heavy-duty polyurethane wheels, each with stainless steel bearings for better strength and maneuverability. They wheeled models also include a rugged two-stage retractable handle with an easily accessible quick-release button for unfettered single-handed operation. The inside of the cases can easily be adapted to meet your needs with custom panel kits, foam liners and padded dividers. Aluminum and polycarbonate panel options with waterproof gaskets are available for special applications. They can easily be mounted to the integrated bezel system moulded directly into the lid and the bottom of the case. Cubed high-density polyethylene foam inserts are also available for applications where you need a robust padded environment, and padded organizational dividers are available for applications that require a more compartmentalized approach. A high quality EPDM synthetic rubber seal is designed to resist deformation and provides each NANUK case with its IP67 rating ensuring that your gear remains dry and dust free. An IP67 rating requires the case to be watertight to a depth of 1m (3.3ft) for a period of 30 minutes and it must be impervious to dust. Due to its volume, the NANUK 960 has a maximum buoyancy of 167.6 pounds so it is likely to float when it is not overloaded. An integrated pressure equalization valve is built into every NANUK case to accommodate changes in atmospheric pressure due to altitude and geographic location by allowing air to pass through the tiny vent, while blocking any liquid from passing through. This technology allows the cases to excel in high-altitude and underwater applications. NANUK protective cases were tested for compliance by independent testing laboratories and received certifications the following standards: ATA Specification 300, Category 1 Impact, ASTM D-4169 DC-18 Drop – Vibration – Rainfall, MIL-STD-810F Immersion and IP67 Ingress protection. To test the impact resistance of the NANUK 960, I performed a series of three drop tests from a height of approximately 12′. 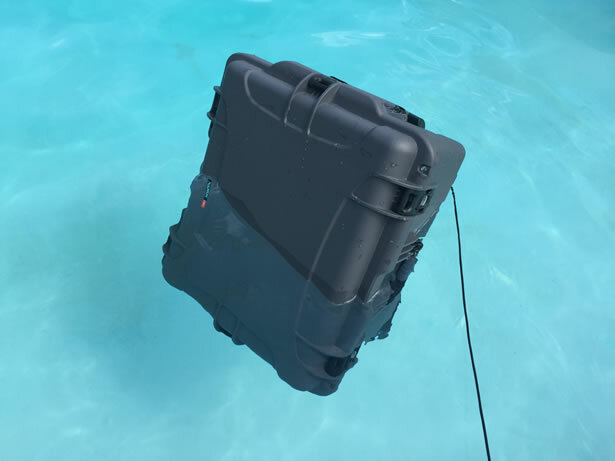 With each drop test, I lifted the case up onto a ladder and let it fall off the top down to the concrete patio slab below leaving behind heavy abrasions and marring all around the outside of the case. However, I was careful to avoid the case landing directly on the wheels because I didn’t want to destroy them before filling it with bricks for the next round of testing. The result of the drop tests were overwhelmingly successful, leaving no visible penetrations or fractures whatsoever. For the second part of the test, I chose to fill the case with 9 pavers totalling a little over 135 pounds. After sealing the lid closed, I wheeled the case over to the edge of the pool and tossed it in. I was surprised to see the case bobbing around on the surface. I left it in the pool for about 30 minutes as I continued to roll it around from side to side. After the 30 minutes was up, I pulled the case out and dried the outside as best as I could before opening it up. As expected, the inside remained completely dry. The NANUK 960 passed the test with flying colors so I decided to take the testing to the next level. This time I would try to sink it. 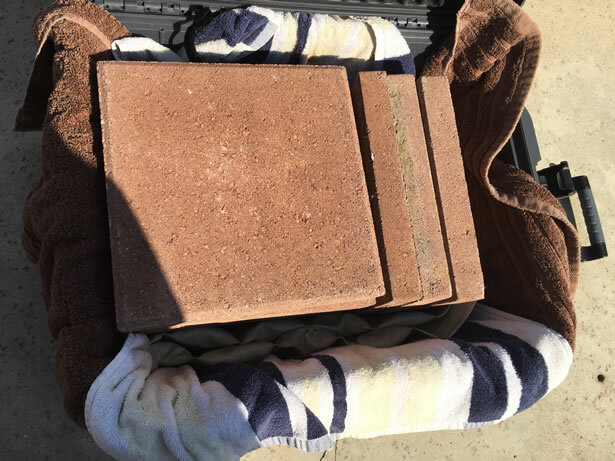 Only one more paver would fit inside the case so I also added a few weight belts and some steel weights wherever I could squeeze them in bringing the grand total up to 180 pounds. However, it was not easy to get it all in there. As a result, the lid seemed like it was a little bowed, and the case was certainly overloaded with weight. Nevertheless, I wheeled the case over to the water’s edge as best as I could and knocked it over the side. As expected, it sank to the bottom immediately and rolled itself to the deepest part of the pool which was 6′ down. I let is sit there for about 30 minutes before attempting to pull it out. As the time passed, I could see a tiny stream of bubbles steadily making its way to the surface. After the 30 minutes was up, I pulled on the paracord tether that I had attached and was genuinely surprised at how heavy it felt. After a few minutes of struggling with it, my son and I were able to lift it out of the water. Again, I dried the exterior of the case and opened it up. Sure enough, the towels were soaked and it was filled about halfway from the top with water in addition to the bricks and weights. In hindsight, I probably should not have overstuffed the case to the extent of bowing the lid, and the pool was also twice as deep as the IP67 rating. I highly doubt that anyone would try to stuff a NANUK 960 with so much delicate gear that it weighed more than 150 pounds. It was all I could do to reach the 180 pounds with bricks and weights. UPDATE: I decided to go ahead and rerun the final test, but this time I was sure not to upset the seal of the lid with the bricks. 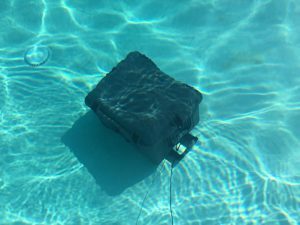 I also kept the box from sliding down the slope of the pool below 3′ and held it there for 15 minutes before bringing it up. This time I did not notice any air bubbles leaking out so I knew it was working this time. Once I brought it up to the surface and opened it up, it was dry as a bone. No water was able to penetrate the seal. Plasticase’s entire NANUK product line are insanely rugged protective equipment cases easily capable of performing in some of the harshest of environmental conditions on earth making them ideal for military, industrial and medical applications. Stuffing the NANUK 960 with 150-pounds of gear is no problem for it at all… It’ll still float with everything inside remaining dry and dust-free. When your gear is important to you, don’t skimp on quality… If you come up short, your life could hang in the balance. It is very important to find the right size case for your gear. They are not very light and they do take up a lot of real estate. In my case, I would have been much better off with a much smaller model capable of being used as a carry-on rather than the huge bass drum that I chose. The smaller size would likely have fit all of my electronic gear and camera equipment with room to spare. I figure I’ll get myself a drone or turn this tub into a giant mobile faraday cage in a future article. NANUK cases are competitively priced and they have a rock-solid warranty to boot. 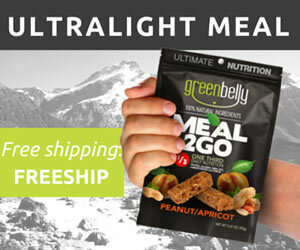 They offer a wide-variety of options so they can easily be tailored to meet your specific needs. 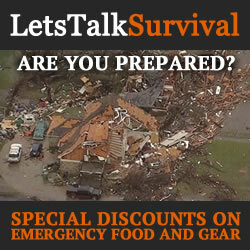 I find they are worth every penny and would happily trust my most sensitive gear provided it was not overstuffed. Two thumbs way up to Plasticase and their NANUK product line! Plasticase initially started manufacturing plastic cases in 1984 under the name Resentel Ltd. A few years later, after the company’s ownership was restructured, Plasticase emerged with a clear mission: design, engineer and manufacture the highest quality injection molded plastic cases in the world. At first paralleling the success and trend created by “Swatch” (plastic watches made in Switzerland), the first product initiative made its debut as a fashion accessory and was sold as a cool “must have” case for students and young adults through upscale department stores, trendy design shops and fashion accessory boutiques. From this first product, the 639 attachécase, the line has grown to over 20 sizes and styles adapted to a wide variety of users with a clear focus on the needs of the B2B market. As the company evolved, demand for an innovative line of robust waterproof cases became evident. Plasticase moved forward with a bold response: NANUK “The Evolution of Protection”, a complete line of waterproof and impact resistant protective cases rated for military, law enforcement and professional users.